World Land Trust (WLT) started its pioneering work more than two decades ago in Belize, a small country in Central America, about the size of Wales. Programme for Belize (PfB) was the Trust’s first fundraising initiative to buy threatened land and create a protected area. Bethan John visited the reserve to see how this programme has developed. Driving into the rainforest in northern Belize is the most dramatic display of why we must buy land for conservation. It’s an hour and half journey from the nearest big town, Orange Walk, down a pot-holed road to the PfB Rio Bravo Conservation and Management Area (RBCMA). The trip takes us through recently harvested cornfields; all the way to the horizon the land looks barren, with farmers’ use of slash-and-burn giving it a desolate appearance. Slash-and-burn is one of the most environmentally damaging agricultural practices, as it removes soil cover and leads to immediate and continuing loss of the soil’s organic carbon. This is devastating for the environment, as soils contain more carbon than our atmosphere and forests combined. It seems like there is no hope for life; from cornfields – a monoculture that is deprived of richness and diversity – the land is turned into arid soil. But then suddenly in front of us there is a glaring wall of lush greenery. Soon we are driving though the rainforest reserve surrounded by the squawks of tropical birds and the roars of Howler Monkeys. World Land Trust (WLT) was founded in 1989 to raise funds to purchase acres of threatened tropical forest in Belize. © David Tomlinson. The transformation in the landscape is breath-taking. I’m reminded that without the generosity of WLT supporters in the early days this rich habitat, with its thriving wildlife, would have been destroyed. Now it stands a living, flourishing example of what land purchase for conservation can achieve. 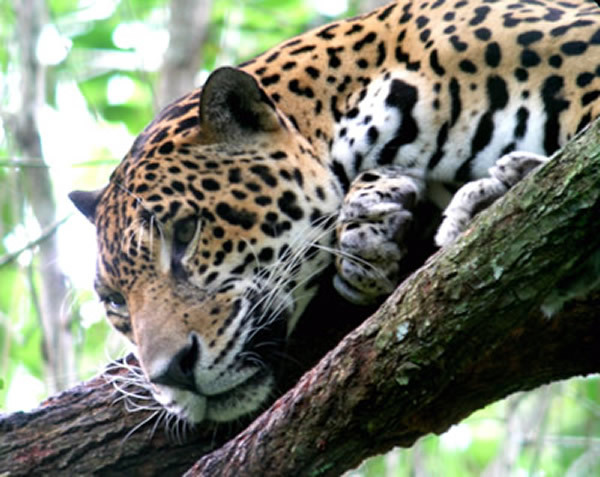 The RBCMA is a 260,000 acre (105,222 hectare) reserve that is reputed to have the healthiest and most plentiful population of Jaguars in all of Central America. PfB, WLT’s Belizean programme partner, own the reserve and have developed small scale tourism to help support the ongoing protection and management of the reserve. There are two ecotourism sites, La Milpa and Hill Bank, both of which have trails for nature lovers to explore the rainforest and spend their days wildlife watching. In my first week I stay in the palm-roofed wooden eco-lodges of La Milpa, trekking with PfB’s naturalist guide Melvis Valdez. A born enthusiast, Melvis is passionate about sharing the beauties of the forest and has an uncanny ability to spot wildlife – from birds to beasts. Our first trek takes us to an ancient Mayan archaeological site just three miles from eco-lodge, where Melvis explains that in 1996 the site received international recognition when a royal Maya tomb was found and a male skeleton adorned with a jewelled necklace was unearthed on its grounds. Most of the La Milpa Mayan site remains unexcavated and has been reclaimed by the jungle. It’s just one of 60 archaeological sites that are protected within the reserve, attracting more than a hundred archaeologists every year. We don’t have long to wonder about the ancient history of this place before we’re approached by a family of Spider Monkeys, who are less than happy to find us in their sacred home. In the tree top canopy, baby monkeys cling to their mothers’ necks while the males take on the role of bodyguards. 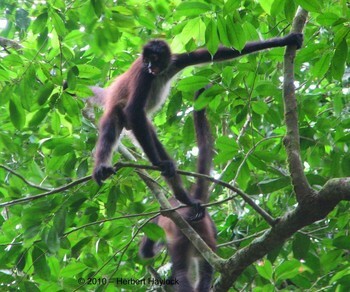 Spider Monkeys are territorial and can be aggressive; their jungle intimidation techniques begin with swaying vigorously on branches, snapping them, and throwing them down at our heads. Their warnings do not have the desired result on tourists desperate for a good photo. Stage two of intimidation – splattering urine and faeces down from the leaves above – sends us scurrying. This is far from my only wildlife encounter during my stay at La Milpa. I witness herds of White-lipped Peccary, which charge about in family groups of between 20 and 50 animals, and are known as ‘sounders’. I also catch sight of a Grey Fox and a Royal Rat – a pig-like rodent, called a paca, which became a celebrity after Queen Elizabeth II infamously ate one on a visit to the country. As well as all these mammal sightings, the reserve is also renowned for its bird life. It is a haven for 390 species and welcomes 25 migrants, with knowledgeable guides like Melvis on hand to help you tick-off your Life List. Programme for Belize, WLT’s first project launched in 1989 and completed in 1996, helped develop the Trust’s model for working through overseas programme partners, as well as its mission and subsequent projects. By the time fundraising for PfB had finished, the programme had attracted more than $2 million for land purchase and research into sustainable forestry, and had helped purchase 2 per cent of Belize. 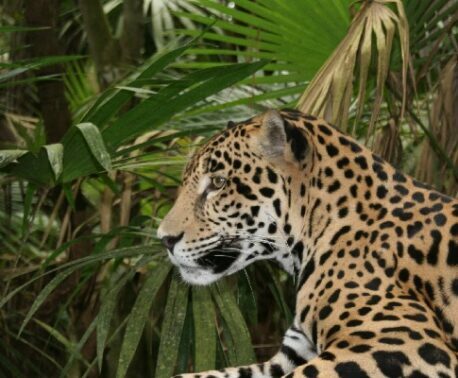 Many supporters went on to contribute to Friends of Belize enabling further commitment to the long term conservation of Belize’s wildlife and natural resources. PfB’s goal of interlinking of economic development with nature conservation has been a resounding success, and demonstrates in no uncertain terms that it is possible to develop sustainable income streams, help local people to achieve a better standard of living, and protect biodiversity in all its manifestations.